Was it worth it? 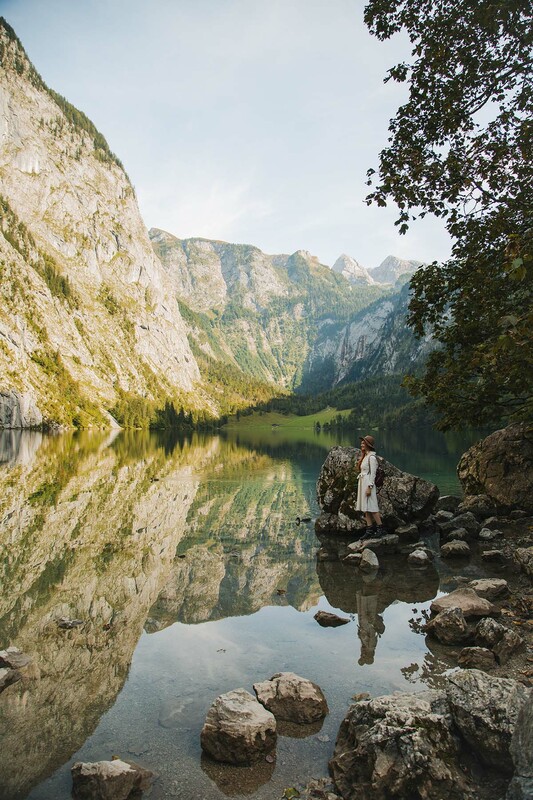 Traveling all the way to Germany to visit Königssee in Bavaria? 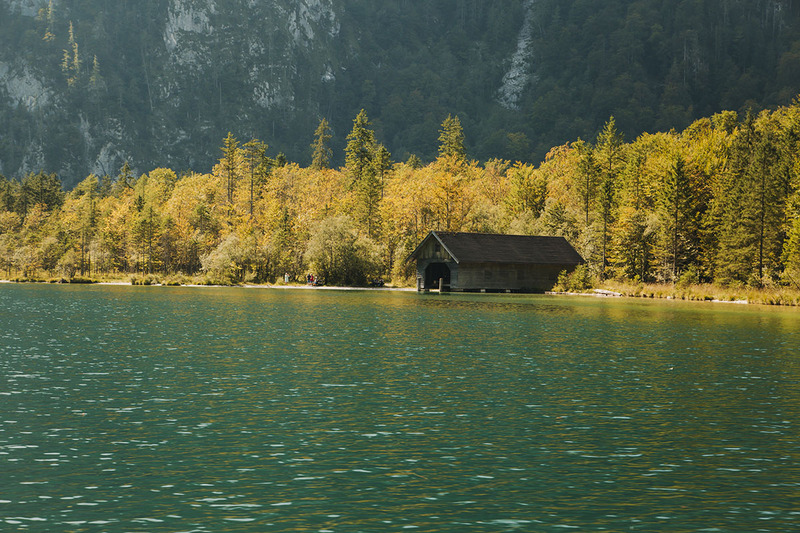 Königssee belongs to the Berchtesgaden National Park and it is Germany’s deepest lake. Many people claim that it is also Germany’s most beautiful Alpine lake and it is also one of the most visited destinations in Germany. But is it all just a hype? Back in September, my bestie Anja and I went there to see! 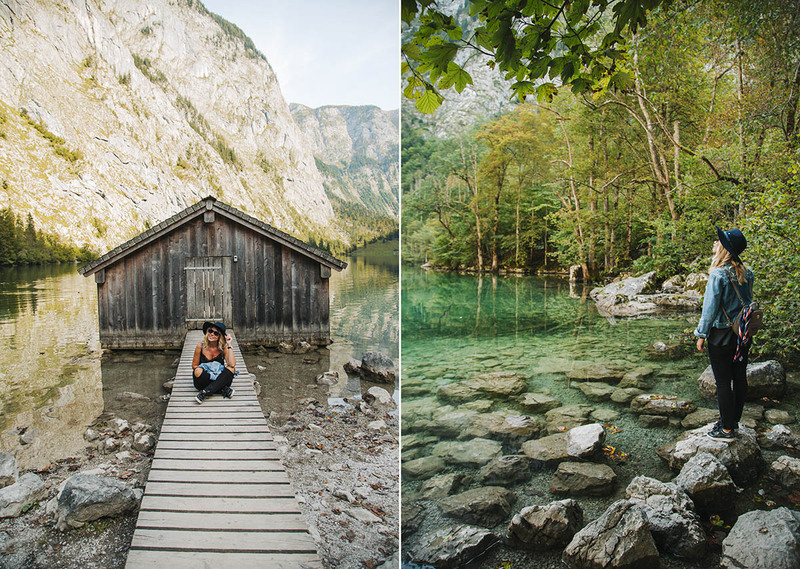 Königssee was the last stop of our short, but gorgeous road trip through Austria, and eventually also Germany! Before moving on, I need to say, that Germany has a special place in my heart. Once upon a time, that feels like another life, it was home. Home of a young me. Of me growing up, all alone in a foreign country. Starting from 0, making new friends, renting my first flat, mastering the language, going to university, finding a job and so much more. It is enough for my feet (or wheels :D) to merely touch the German ground and off I go, back in time, traveling on an emotional roller coaster. And no, I didn’t have an affair there, if you mean that is why I am flooded with emotions haha! I am sure I would feel the same about any other country, if I passed there through this, for me crucial rite de passage (my colleagues anthropologists will know :D). So it is not that I am some crazy fan of Germany because of Germany per se, but because of really huge change of my life back then that happened there. If you have experienced the same with some other country, I am sure you know what I mean! 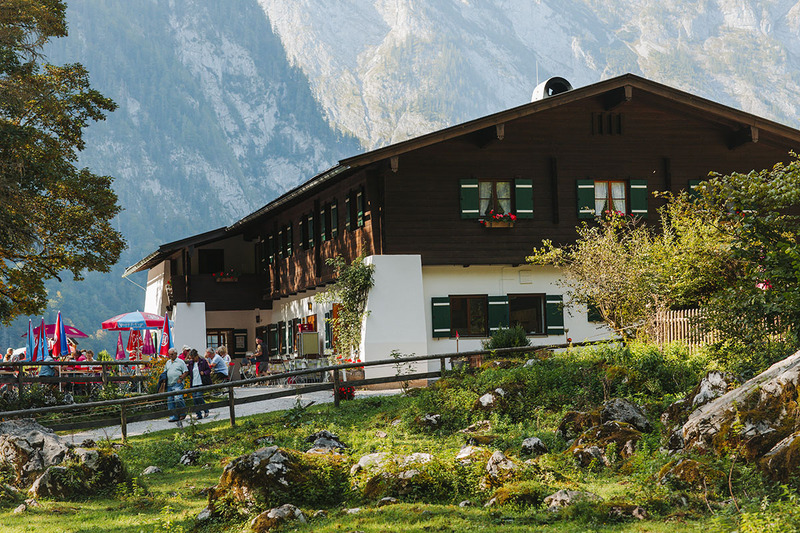 Maybe one day I will let my memories just fly all over one special blog post about my German life, but now I am back to Königssee! …and while doing so listen to the really cool and funny boat guides and their stories about the lake, its legends and curiosities. The highlight of the ride will be the moment when a guide plays the trumpet so that you can hear the incredible echo bouncing back from the mountain walls. I filmed all that and you can hear it if you check our IG highlight called Austria Roadtrip. 🙂 Over there you can see more pictures. You need no pro camera, a phone is just enough to capture the beauty of this place! 2. 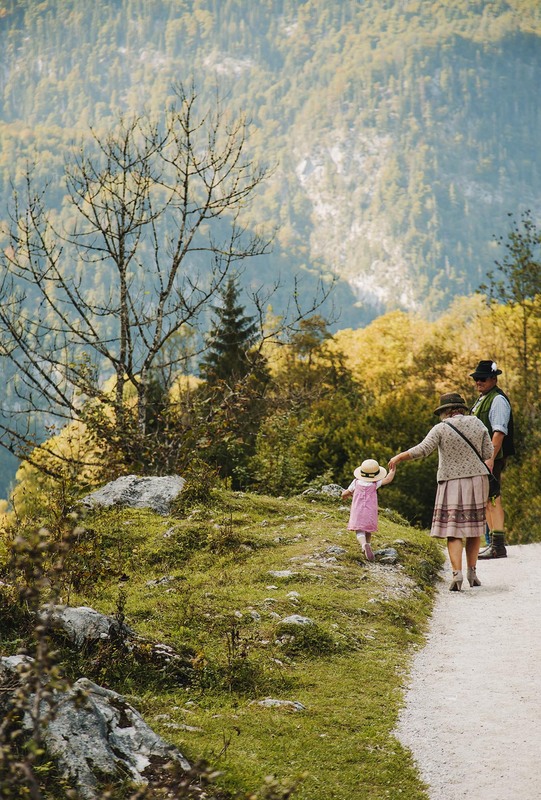 If you enjoy hiking! You can decide how long and far, but make sure to drive all the way to the last stop called Salet. Anja and I are not really hikers, so we only walked to the Obersee. We also didn’t have much time to go to the waterfalls and natural pool. 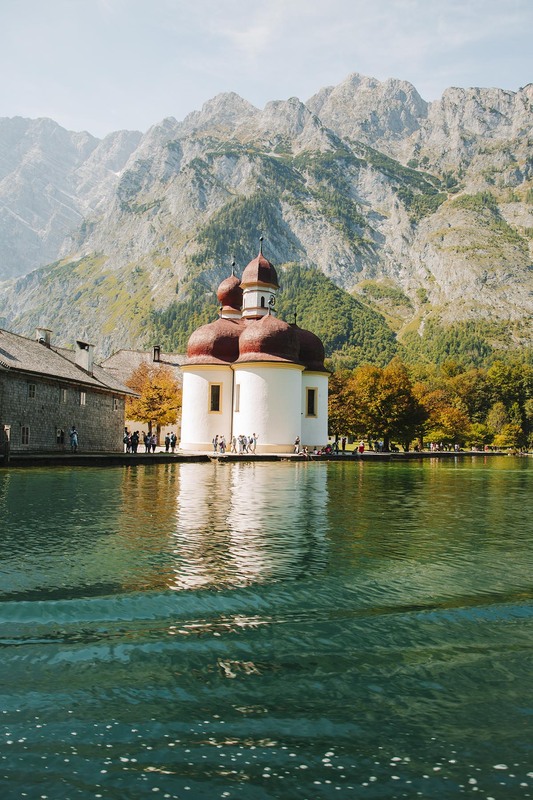 Ok this about the natural pool (search on Instagram, location Königssee and you will find it) would totally be worth the hike but the guys from the information center at the lake didn’t want to tell us how to get there. They said it is dangerous and so on. But if you are real hiker, you will know for sure how to dig that information! Also, if you are like our Insta friend Philipp, aka the Yellow Guy, you can end up hiking to the caves and experience the snow storm in the middle of summer. Check his IG posts here to see what I am talking about. When your friend is a pro poser. 😀 Incredible reflections at Obersee. 3. 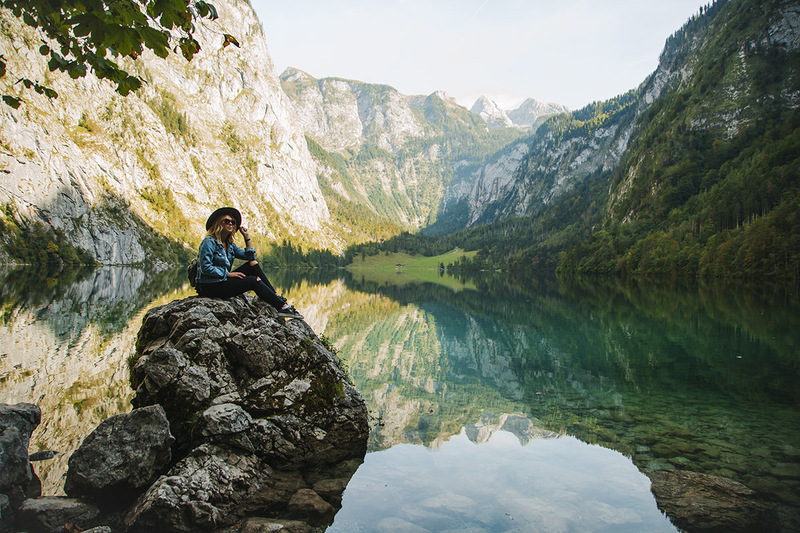 But most of all, I am sure that a visit to Königssee will be more than worthy for you if you are a genuine nature lover! If you want to explore or simply sit there in peace, observing all the natural beauty that is surrounding you. 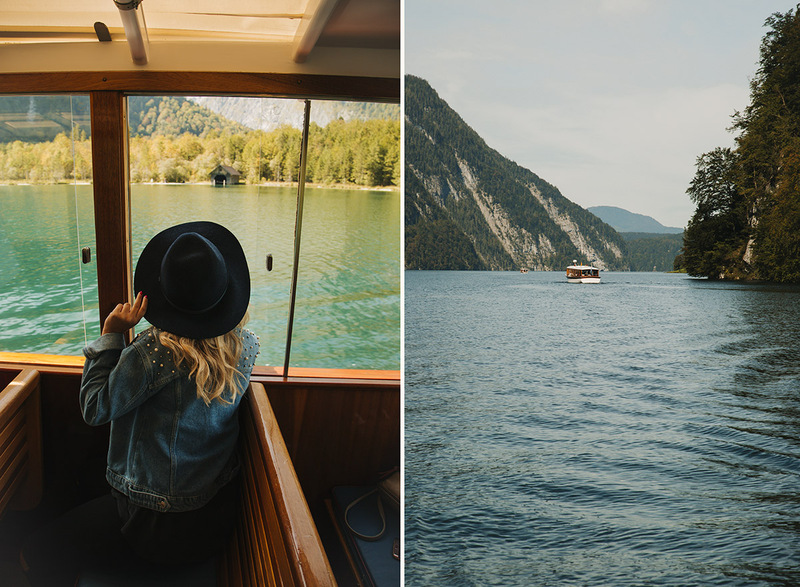 I have visited really many lakes in my life, and I can say that Königssee for sure ranks among top 5 from the ones I have seen. My first time at an Alpine lake, that air, the color of the water, the reflections, it was really gorgeous. My favorite was the whole boat ride and the echo. The guides really had so much humor and the moment they were playing that trumpet in the middle of the lake was unforgettable for me. Also the reflections at Obersee and that nature, I truly enjoyed! Official Königssee website is here. And the website of Berchtesgaden National Park here. >How to get to Königssee? 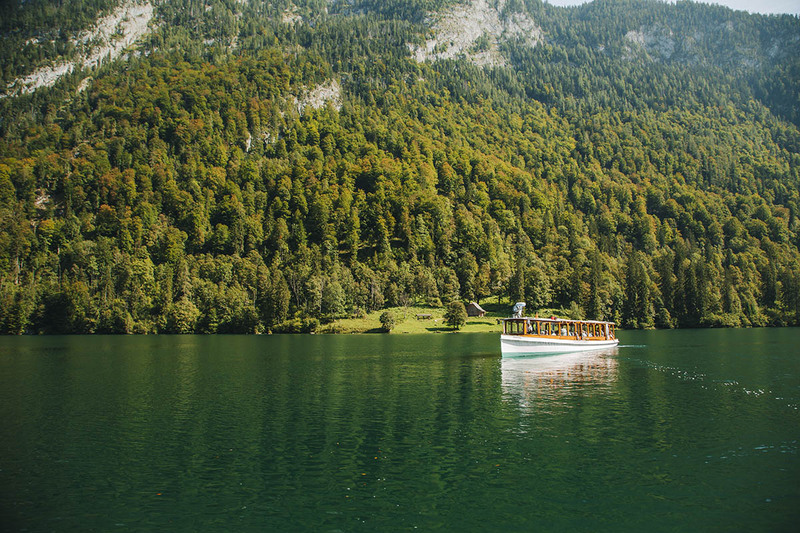 The best and most convenient way to get to Königssee is by car. There is a huge parking place on the spot. The best is to take the 24h ticket for 5 Euros, so you don’t need to worry and have enough time to enjoy visiting the lake. From the parking place you will need to walk around 10 minutes, until you get to the ticket office. There are for sure some organized buses or stuff, but for that it is best that you research on your own. We were driving there from Salzburg and it took us around 30 minutes to get to the parking of Königssee. The only way to visit the lake is by electric boats. 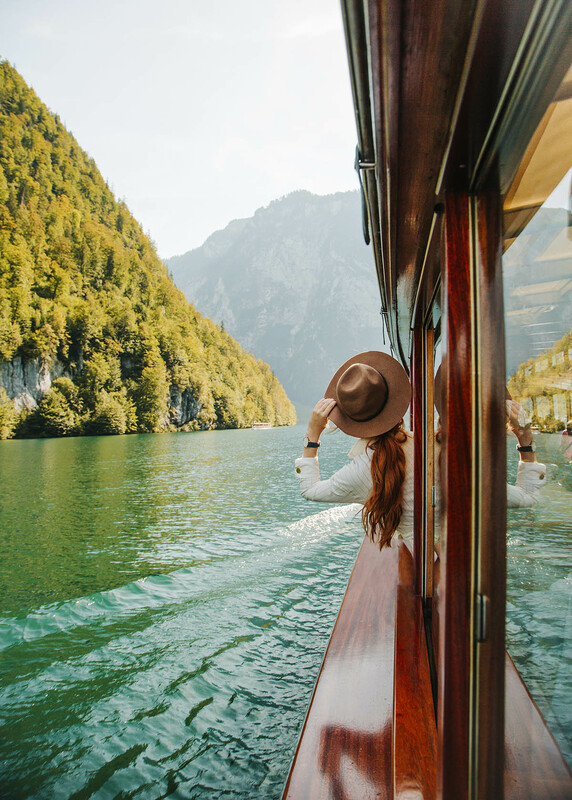 There are two ticket types and both are valid for the way back and forth – one costs around 15 Euros, and that one will take you to the first stop of the boat, which is St. Bartholomä. Over there, you can only see the little church or visit the restaurant, walk around a little and that’s it. 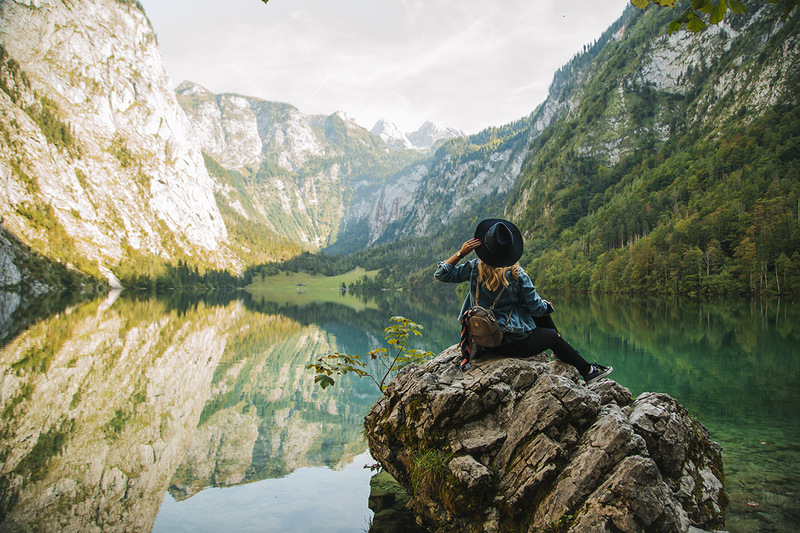 I strongly advise you to take the more expensive ticket (around 18 Euros) with which you drive to the end stop – Salet (there is much more places for hiking, you can walk to little Obersee, see some waterfalls, even hike up to the mountains). 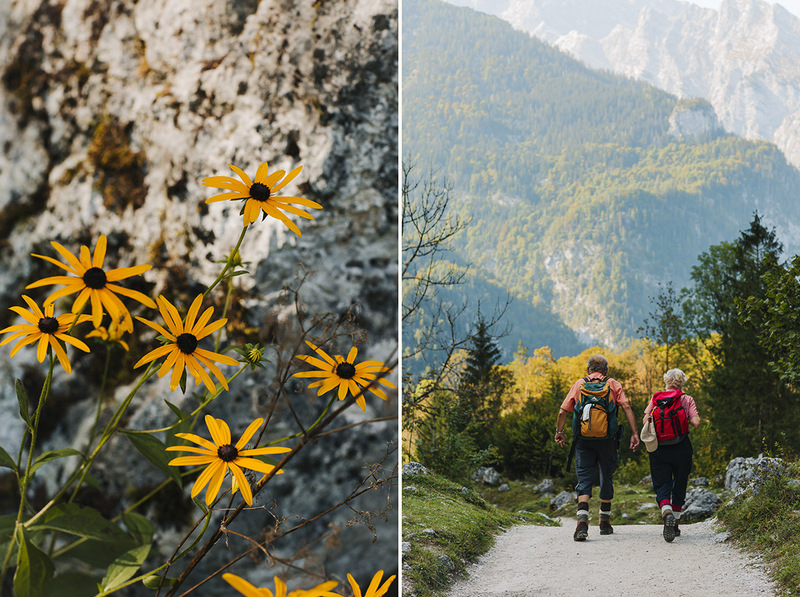 With the Salet ticket you can also take off and explore St. Bartholomä. We personally didn’t find this stop too exciting. The worst was that we had to stand in a massive line on the way back, and wait for over one hour until it was our turn to board the boat that would bring us back (boats arriving already carry passengers from the last stop Salet, and sometimes the boat is so full that it doesn’t even stop). Most blogs recommended that it is better to explore St. Bartholomä after Salet, but I disagree, because you will have no other choice but to wait forever there until boat with enough empty seats arrives so that you can leave the lake. It is enough to snap a few shots of the cute church from the boat and drive directly to Salet. Or to first take off in St. Bartholomä, explore it a bit (15 minutes will probably be enough) and then board the boat to go to Salet. The boats leaving from Salet are always totally empty because this is the last stop, so you will board faster. All this is Obersee, Salet. >When is the best time to visit and how long does it last? I can imagine that autumn must be the best time to visit, because of the colorful nature, but any time you go has its beauty. 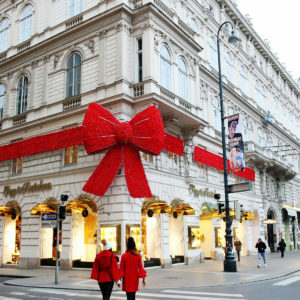 It is also very special in winter. Sometimes the lake even gets totally frozen, so people can walk on it and explore it on foot! You will need at least 4-5 hours for this excursion. The boat ride lasts longer than half an hour, then you need to count on waiting in line and so on. The best is to come as early as possible, especially in autumn-winter time, because it gets dark way too fast. When we were visiting it was basically still summer, so we came around 13h and left at 19h (the last electric boat leaves from Salet at 6 I think, so also be aware of that. Not that you end up trapped and forced to spend the night in some of the restaurant-cottages there or under the stars haha). Please make sure to always check the official website for all the exact information about this organizational stuff. While walking towards the ticket office, you will be forced to pass through a little shopping “village”. How smart, right?! 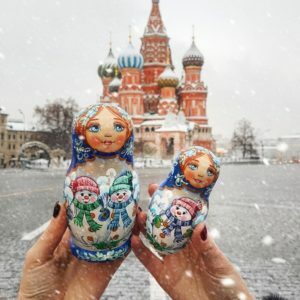 🙂 You will find plenty of cute souvenirs there, some semi precious stones, magnets (I didn’t like them that much though and I am a collector, so I got none in the end), all sorts of wooden stuff, liquors and local curiosities such as (watch out now) – Groundhog fat ointment. Poor little groundhog! But apparently this ointment helps with back pain and so on. That’s all folks! 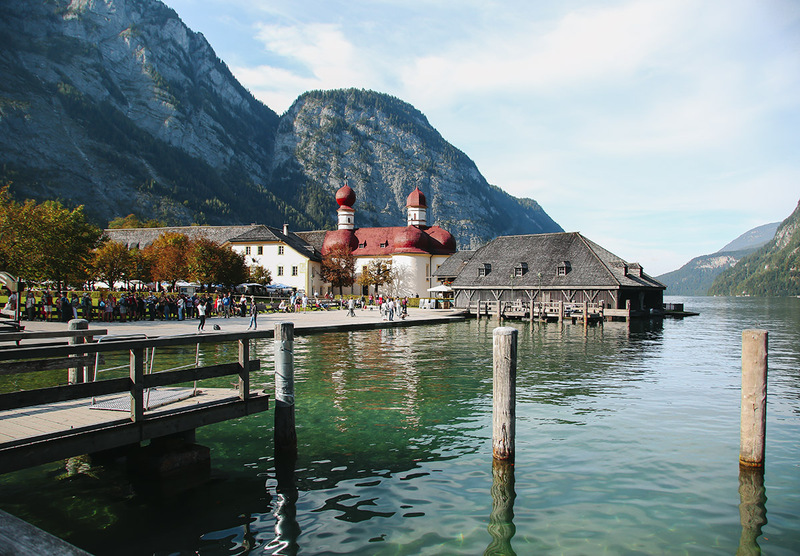 I hope you will enjoy your visit to Königssee and that my tips were helpful. Hm one last thing! Do not forget – comfy shoes, water, something warm to put on (it quickly gets quite cold), put some sun screen protection (I forgot and my face got so burned! ), fully charged battery of your phone and camera. And some snacks!